“Obedience” This is the similarity between Abraham and Noah. Both of them had great faith and obedience to God. The difference is about what happened and what they did at the time. Now let’s take a look deeper to the Noah’s story. In his old age, one day, Noah got commandment from God to do something very strange. Why it was very strange? God commanded him to build a super big ark that can contain the entire of his family and also pair of specific animal. Noah lived in the corrupt, wicked and full of evil era. But he was able to remain faithfully lived in the Holiness and walked with God. He remains loves and pleases God more than anything and he had great faith to God. Throughout the long delay of the coming judgment, Noah continues to faithfully obey to God and even he preached to the people to repent before God destroy the earth. Another evidence that Noah always walk with God and pleases God was, after the flood, he built an altar and offered sacrifices to God (Genesis 8:20). Worship to God was a central part of his life. That’s why he saved by God from the flood. My dear friends, I end this post with some questions to ponder. How our lives today? Have we live not only as good person but as the righteous before God? Can we remain steadfast to hold God’s promise although maybe this time we haven’t seen the answer of what we ask for? Shall we continue to believe in God and continue to be grateful despite the difficulties continues hit our lives? Shall we, by faith, remain obey to do God’s command although we think it’s so strange and impossible? Whether we will continue to uphold our faith when we are in the situation that isn’t only difficult but even may be very wicked? Like all of us right now, Noah was living in a sin nature but he has proved was able to remain lived in faith and obedience. Let us learn from Noah who have firm faith, let us learn to continue to believe even when we haven’t seen anything. Noah didn’t need to test God before he built the ark. God commanded, he obeyed and he did it. Noah remained faithful, trust, and upholds his faith to God even though he had to wait for 120 years before God fulfilled His word. Noah made faith as a believing. He didn’t know when God will fulfill His word, but he really believed it will happen. 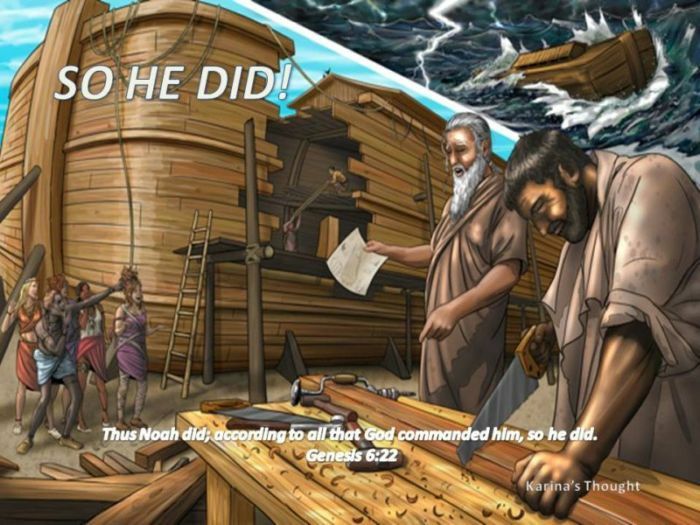 Noah not only had a great faith but his faith worked together with action. By faith he did very well God’s commandment. If Noah was using the very strong gopher wood as the the material, let’s build our spiritual “ark” by using the very strong and unwavering faitt, with one door which is mean only The Lord Jesus Christ is one and only way for our salvation and the door into Heaven. Also a door that we can knock to hand over all of our problems, fear, anxiety, and everything we ask for. Our spiritual ‘ark” just have one window above which is mean we have to always focus to look up only to God not look down or to the world around us and have three decks: Faith, Hope, and Love. Hello my dear friends, sometimes ago I have wrote a series of “Woman of faith” Few days ago my husband said that seems incomplete if I don’t write about “The Man of faith” So this post and the following posts will talk about some bible figures who known as “Man of faith” Anyway, all of you have to know that this post isn’t a bible commentary, bible study or something. It is just my thought based on what I have learned. So, if you find some wrong perception or misinterpretation, I am so honor you give me critics or suggestion. At that time Abraham certainly didn’t know what will be happen but he remained obey to follow God’s command and set out according to God’s command. Abraham did it because he looked by the eyes of faith. 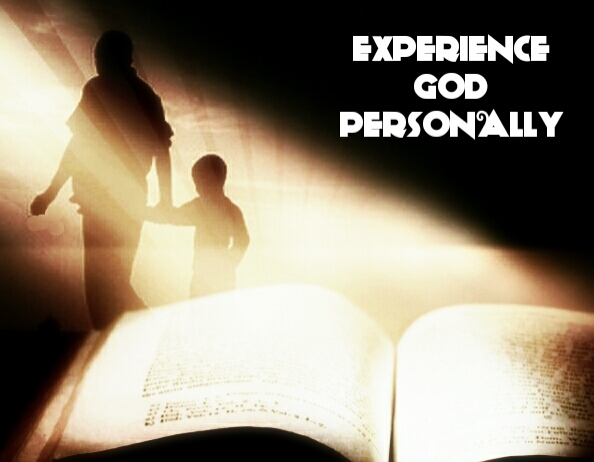 Abraham trusted and believed that God will guide him into the uncharted territory. There was no questioning and no wavering! He still went and dwelt in the foreign land that God promised to him. For he waited for the city which has foundations, whose builder and maker is God. It turned out, Abraham had a vision about the future, something that he hadn’t seen in real but he had a proof through his faith. Others may not see it but Abraham was able to saw it with his eyes of faith. Now we come to the hardest test of Abraham’s faith (In my opinion). I remembered one of my friends who were really disappointed and angry to God because God called home her one and only daughter. Thing that made him upset and angry was, she had wait for 7 years to have her daughter and the doctor have stated that she will very difficult to have a child again and not recommended for some reasons. She once said to me, “I have been waiting for 7 years to get the answer of my prayer to have a child. God gave but God himself took my daughter back. What is actually God wants from me? It would be better He didn’t give me a child at all if eventually He took my daughter back!” My dear friends, now let’s compare my friend’s story and Abraham’s story. Abraham believed that God had a very good reason for asking him to sacrifice Isaac, and that somehow Isaac would have to be raised from the dead to fulfill the promises God had made concerning him. Maybe right now we are in the very hard time. We are hit by so many hard troubles and challenges and we are in the uncertain situation. Once again allow me to encourage all of us face it all by strong and unwavering faith. 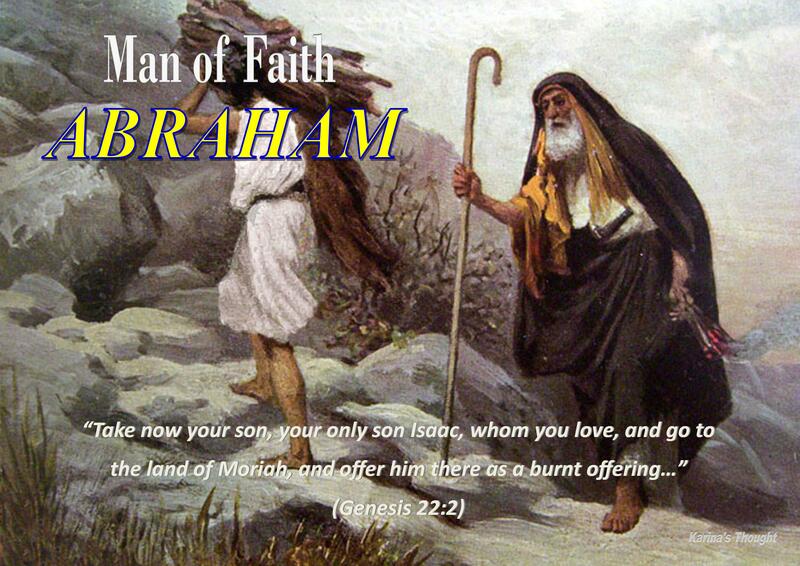 Let’s learn to have great faith, faithful, and obey like Abraham. By faith let us completely believe that God already has beautiful plan for all us. Let’s keep hold God’s promises with the unwavering faith. By great faith Abraham received all the God’s blessing right in His time. Blessing I will bless you, and multiplying I will multiply your descendants as the stars of the heaven and as the sand which is on the seashore; and your descendants shall possess the gate of their enemies. (Genesis 22:17) Amen.